We’re in the business of “healthy for your hair,” using food ingredients rather than chemicals. Introducing a new approach that leaves chemicals behind, you can experience clarifying, resetting, and rejuvenating your hair and scalp, revealing your best hair ever. The big difference between this and other top brands–including organics, is that the food grade ingredients have been refined and carefully selected to deliver superior style performance demanded by the best! I’m cleaning up my act! I’m exercising, eating right, and creating myself newly! Now it’s time to make my hair the best it can be as well! There is a moment when you realize you can do anything, right? Getting a fresh new start can catapult you to the next level, and the more you do the right things, the easier it seems to do the next right thing! So, now that you are eating right, exercising, and cleaning up your act, let’s get your hair and follicles on that journey as well. Yet, this time, you can now take it to heights only the finest stylists, celebs, and aficionados know about perfect hair! With Belegenza’s FOOD grade perfection, you will not only remove toxic silicone chemicals and more, you will also take your hair into a new world of conditioning, moisturizing and strength reserved only for those who appreciate the finest. You cannot imagine what Belegenza will offer you, because it has never been done before. So, if you are new to Belegenza… you are in for a treat. NO other company has ever combined food elements that have been extracted in these ways, because science and nature have just made it available… thanks to our vision and insistence on perfection. To make way for the POWER of our patent-pending and food grade elements to do their work on your hair core, we must insure that all chemical residue is diminished. While it is feeding your hair and follicles, we include one of our secrets to detoxing your follicles. By using Chrysanthemum flower extract as a tea, you further enhance your hair’s future of healthy and PURE growth. Known only by certain cultural leaders, this tea is an almost forgotten secret for hair. Because those who use this tea during a lifetime, few ever had the concern for growing more hair because they didn’t lose it to begin with! Known to neutralize chemical residues immediately after coloring this shampoo reaches residue embedded in the cuticle and cortical fibers of the hair to clear a path for Belegenza’s deep conditioning elements to work on the core of your hair. Pristine seawater in remote areas provide certain seaweeds to flourish and create perfect springy protein chains that nourish. By delivering this at the scalp level, your follicles are empowered to deliver, and as these proteins wrap themselves into the hair strands, your hair responds with body and bounce like it’s young again. Used daily, it keeps moisture balances in check for consistently healthy and flexible hair that looks vital and vibrant day in and day out. Based on several cultures’ beliefs and proof of hair growing ingredients, this is a combination relies on not just one, or two, but over 17 elements. First of its kind in the world, this power packed concentrate targets the follicles with purity and nourishment that delivers 24/7. It’s no wonder why all cultures and races get extraordinary results. So compatible it can be sprayed in every day to insure proper delivery of what your follicles want and need. Stronger, longer, and thicker…daily. Rather than chemical silicones, acrylates ( liquid plastics) as found in common and high end gels, mousses, and styling products, PerForm delivers body and style memory based on flexible, soft to the touch springy proteins. Because anything left on the scalp can make a difference, you must be concerned with what difference you are making. Typical gels and such leave a layer of chemicals which might be the very problem with thinning hair. Give your hair every fighting chance to grow by now using only ingredients that are good for the scalp and follicles AND also give your hair a natural body as if it is young hair again! 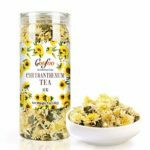 All the while, enjoy the benefits of Chrysanthemum tea as our compliments. While you are relaxing to a cup per day, be sure to snap a photo of your hair before you begin. You will be glad you did, as you welcome your new vibrant hair into the new world of food grade Belegenza! Purchased separately, you would pay $144. For a limited time, you can get all of these products, along with the tea** ( $12 value) and Free Shipping within the Contiguous U.S. ( $15 value ) for only $134, saving you more than $10!